MELBOURNE – Canada’s Genie Bouchard won the junior Wimbledon title in 2012, but is not surprised that she is already in an adult Grand Slam semifinal. She feels like she progresses every day, every week, every month. She came into the Australian Open ranked No. 30 and has knocked of one veteran after another including former No, 1 Ana Ivanovic 5-7 7-5 6-2 in the quarterfinals. She almost never gives up her on court position. She always seems to be going forward. She isn’t wild but hits hard off both wings. She has a very strong first serve and competes like hell. She may appear to be a just another pretty blonde to some (like the Aussie-based Genie’s Army) who have never met her off court, but she talks and acts like a standard super jock. Tennis is her life; not only does she plays she watches a lot of pro tennis in her spare time. She is no-nonsense player and appears to be a no-nonsense person. She sees her rapid rise as part of the plan and not very surprising at all. 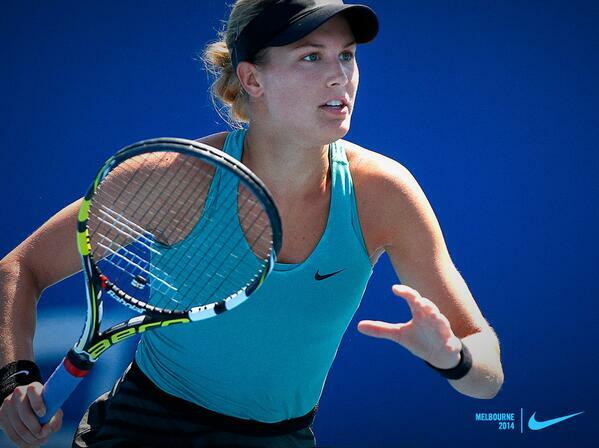 Bouchard might not be surprised but it’s very rare for teens to make a major impression at Slams these days. Sloane Stephens did as a 19-year-old last year and now one of her peers has accomplished it. Madison Keys, who is a year younger than Bouchard, is not ready yet, nor is Bouchard’s good friend Laura Robson. Bouchard has a good disposition and isn’t easily rattled, even after Ivanovic banged away at her during the first set. With her victory over Ivanovic on the raucous Rod Laver Arena and her fourth round win over home countrywoman Casey Dellacqua on the same court, Bouchard has shown she’s ready for the big stage. But as good as she’s been, she is going to have to take big step up to best her semifinal foe, Li Na, who has been on fire her last two matches and smoked Flavia Pennetta 6-2 6-2 in their quarterfinal. Li has reached two Aussie Open finals before and seems overdue for a title. Li is a better player than Ivanovic and will be a bigger challenge for Bouchard, but there are times when China’s top player loses focus, which could make her vulnerable to an upset.